There are few dishes that can bring a crowd together better than a big plate of nachos. When that tray of piping hot chips comes out from the oven, it has this magnetic draw that pulls everyone in. It seems like nobody can resist chips and cheese. Nachos make for a great dish to bring to potlucks or gatherings. 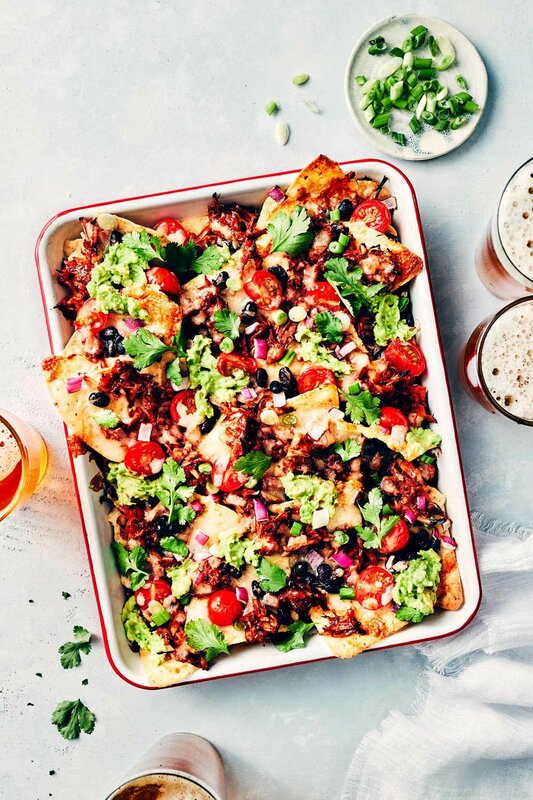 It takes very little prep work - heck, you can assemble nachos literally within minutes...and you don’t even need plates or utensils to serve them! Since everyone has tried nachos at least once, we like to put our own special spin on them. When serving a crowd of meat-loving friends, this version becomes especially fun. 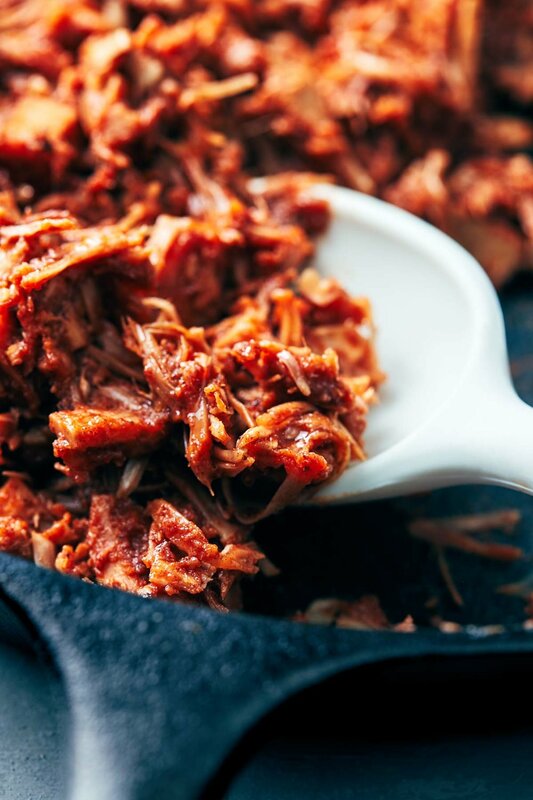 Jackfruit makes for the perfect pulled pork stand-in. Its flavor is mild, meaning it can take on whatever flavors you’re using in your dish - and in this case, it’s a spicy, tangy, delicious BBQ sauce. After the jackfruit is sauced up, it’s shocking how much it reminds people of the "real" thing. Assembling this dish is as easy as 1-2-3. The main step is cooking the “pulled pork”, which thankfully comes together in mere minutes, rather than the 2-4 hour long process of cooking actual pork. We like to use our Healthier Homemade BBQ Sauce as the seasoning, but if you’re partial to another barbecue sauce, then feel free to substitute that instead. If bringing this dish over to a friend’s, then it’s usually easiest to cook the “pulled pork” in advance. The remainder of the toppings are what we like to serve, but feel free to adjust depending on what you have on hand. Cooking time might depend on your oven, so keep an eye on the tray. You’re looking for melted cheese and toasted chips - it’s nothing you haven’t seen before. To add a bit of avocado-goodness to this dish, the recipe calls for a super simple “guacamole” (i.e. mash up a ripe avocado with a couple seasonings). 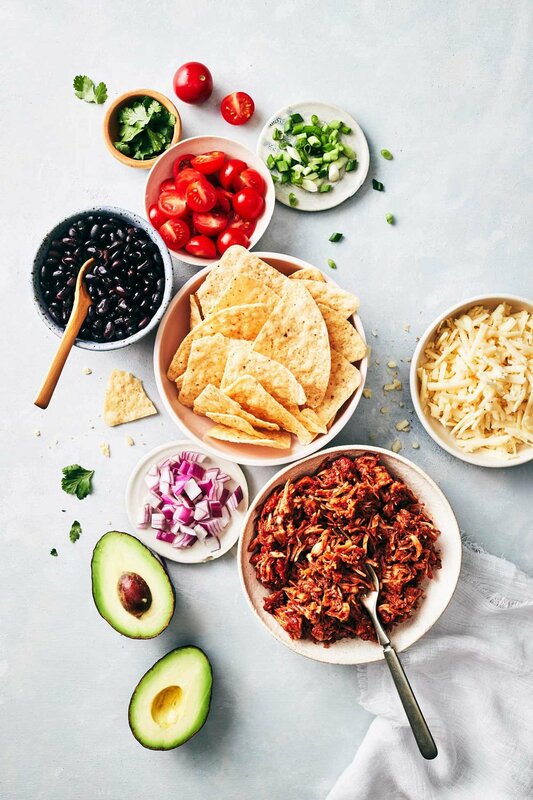 It’s important to add the guacamole just before serving, to keep it the freshest; although the lime juice will help to prevent the avocado from browning too soon. Give this indulgent dish a try the next time you’re feasting with friends! It’s an awesome way to show them how much fun vegetarian/plant-based eating can be. Also remember that the recipe can be scaled down if needed. Anguel & I do this occasionally when we’re craving some ridiculously indulgent nachos, but couldn’t possibly finish the whole tray. It’s not a problem we usually have (heh), but you know, the option’s there for you. Preheat oven to 400°F. Use a colander/strainer to rinse canned jackfruit thoroughly. Shake to remove excess water. Heat a skillet pan over medium-high heat. Add oil. Once hot, add rinsed jackfruit. Cook for 5 minutes, stirring regularly with a wooden spoon. As the jackfruit softens, you can use the back of the spoon to “mash up” the jackfruit until it separates into small pieces that resemble pulled pork. Reduce heat to medium. Sprinkle onion powder, chipotle powder, and salt over jackfruit. Stir to coat evenly. Add BBQ sauce and stir well until jackfruit is evenly covered in sauce. Cook for another 5 minutes, then remove from heat. Lay tortilla chips out on a baking sheet. Spread the jackfruit out over the chips, then sprinkle with cheese, onion, tomatoes, and black beans. Put the tray in the oven for approximately 10 minutes, or until the cheese is melted and golden brown. Meanwhile, in a small bowl, add avocado, 1 tablespoon lime juice, cumin, and pinch of salt. Use a fork to mash the avocado into a guacamole-like consistency. Taste and mix in additional lime juice if needed. Add the avocado mixture on top of the cooked chips. Top with sliced green onion and/or cilantro if desired. Serve immediately. -*Canned jackfruit is either sold in either brine, water or syrup. Select only the cans that are labelled "in brine" or "in water". Avoid jackfruit packed in syrup, as this jackfruit is sweetened. -During the cooking process, feel free to pick out any pieces of the jackfruit that won’t mash up with the spoon or that don’t look good. Everything is edible, this is simple a matter of aesthetics.